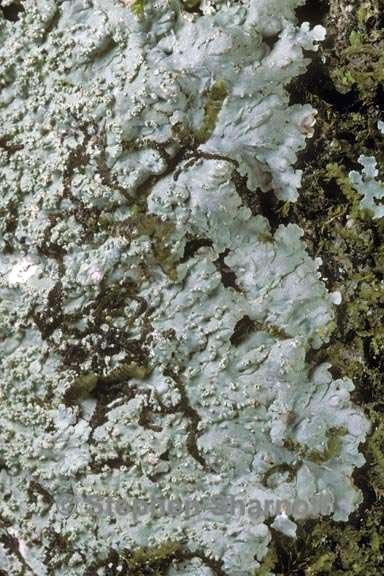 Thallus: foliose, loosely appressed, up to 12 cm in diam., pinnately or subpinnately lobate lobes: radiating, confluent, flat or convex but usually concave towards the lobe tips, rarely convex throughout, 0.2-3 mm wide, distinctly flabellate towards the lobe tips upper surface: gray, bluish gray, almost white or stramineous, slightly pruinose or without a pruina, finally sorediate polysidiangia: present, developing from isidia-like outgrowths, bursting open and revealing soredia, finally apically crateriform pseudocyphellae: distinct, laminal and marginal, usually restricted to the peripheral parts of the lobes, sometimes reticulately confluent medulla: white, the lowest part often orange, especially towards the lobe tips lower surface: black in center, paler towards lobe tips, erhizinate Apothecia: rare, laminal on thallus, 0.5-1.5 mm wide disc: black, slightly grayish pruinose but mostly without a pruina ascospores: brown, 1-septate, ellipsoid, 16-22 x 7-9 µm Pycnidia: immersed in warts conidia: bacilliform, 4-5 x 0.8-1 µm Spot tests: upper cortex K+ yellow, C-, KC-, P+ yellow; medulla upper and lower part K-, C-, KC-, P- Secondary metabolites: upper cortex with atranorin, medulla with divaricatic acid and few terpenes in low concentration. Substrate and ecology: on bark, wood and rocks, from sea level to the edges of montane rain forests World distribution: in all tropical regions of both hemispheres with scattered collections from eastern parts of subtropical North America Sonoran distribution: especially in thorn forests and desert transition areas and occasionally oak-conifer forests of Baja California, Baja California Sur, Chihuahua, Sinaloa and Sonora. Notes: Dirinaria aegialita is very similar to Dirinaria applanata, especially when the formation of polysidiangia is not so obvious. In these cases, the granular "soredia" with a very thin but distinct cortex are decisive for all the specimens treated here as Dirinaria aegialita.